A woman’s place is in the home…or, NOT! Unless that home is her faithful alma mater. The experience was beyond rewarding and the students, inspiring. I have my own startup, Say It Media, and for years have been advocating on behalf of women – writing, speaking and creating the suite of LikeSo speech applications for confident, articulate speech. I took the students through my own career trajectory, highlighting my “adventures” as a woman in business, my work as a marketing and communications executive in technology, my online community, “Our Digital Daughters,” and my own “aha!” moment when I decided to stop promoting other people’s software, devices, and services, fulfill my personal passion, in order to create my own. 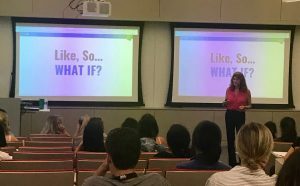 When the slide came up, “Like, So… What If?” I talked about the seminal week that strongly influenced later developments – when it all came together. What if we could all get our voices heard in a way that compelled others to listen? What if we could curb our verbal habits, the uptalk, vocal fry and verbal graffiti (like, you know, totally!) that water down our meaning, make us sound less competent and distract our listeners? What if we could stop apologizing when there is nothing to apologize for? What if we could use AI and voice recognition technology to bring awareness to our speech and help us all practice to be better – more powerful, articulate, persuasive communicators? What if we could level the playing field for women and minorities and put a personal speech coach into everyone’s back pocket? It has been about two years since I, along with my Cornell friend and product whiz, launched the consumer app, LikeSo: Your Personal Speech Coach. When it hit #4 overall in the App Store for paid apps and #1 in LifeStyle, we knew we were onto something. Since then, we now have a professional product for higher education and enterprises, AI-driven LikeSo PRO. Studies show that the way we speak affects every level of business, from blue collar to CEO and that soft skills like verbal communications account for the #1 gap in the workforce. This soft skills gap is a perfect storm. While communications are becoming more important as we evolve socially and technologically, young workers are tethered to their smartphone and are often more comfortable texting than talking. I workshopped LikeSo PRO with the students. Tell me about an experience you had where you think and internal or external factor related to gender prevented you from reaching a specific outcome or goal. By internal I am talking about “self talk” or “self image” based on socialization. By external, I mean factors outside your control that impacted you. I aggregated the data pulling compelling content. At the end of my presentation, I did a “Big Reveal!” of the results including most overused filler & hedge words. The “winners”? 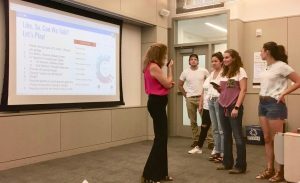 And then we workshopped mobile app LikeSo in groups choosing Topics like “The Job Interview” and “Debate Team.” The students found it enlightening, fun and surprisingly challenging. Q: What was your biggest challenge with creating LikeSo? A: As a woman in the male-dominated technology business and an entrepreneur, I’ve had my share of hard-won lessons. I anticipated these challenges, but finding development talent – both coders and designers that could help me realize my vision – was and remains the biggest challenge. Q: Would you recommend the startup life? A: No. Well, yes. But, it is a roller coaster. You need to be passionate about what is behind your vision to survive the ups and downs. In my case, it was to help girls and women be articulate, powerful, persuasive speakers for all high stakes situations. We sure as heck don’t need any more obstacles in our way. Q: Why do you think women are judged by how they sound? A: The way we speak is a very sensitive issue. My own voice is higher-pitched and very distinctive. People always know me on the phone:-). There are a few camps of thought. Some say, “I’ll speak however I want! Do not judge me!” I understand this. But, I am in another camp. Success demands confident communication. No one is born a great communicator. Like everything, it takes practice. Before we “lean in,” we should make sure we are prepared to speak in a way that compels others to listen. Since I’ve been back, my inbox has been flooded with the students’ gracious, insightful emails, offering ideas, stories, and confessions. I love them all and will be sharing excerpts in a separate post. Do you have stories and insights to share? Please send them my way!